Subscribe to our email news by filling the boxes above so that you are told about our new products and events that will help your business grow! Here it is, what you have been waiting for! 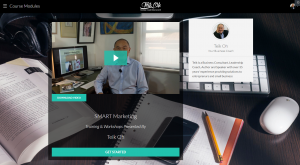 The SMART Marketing online video training and workshop program is launching! The SMART Marketing online video training and workshop program is a 5 week program that takes you through the 7-step process of SMART Marketing. Compiles all your learning into a focused marketing plan with accountability systems built in. 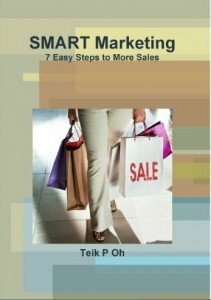 “SMART Marketing” is Teik’s popular book on his simple 7 step process to prepare and implement a marketing plan for your business. Any business can use these principles and in 4 to 6 weeks will arrive at a highly targeted marketing plan. This is the companion to Teik’s popular book “SMART Marketing”. 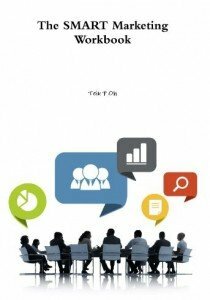 The workbook provides the tools for you to organise a series of brainstorming sessions or workshops to work through the SMART Marketing 7-step process. In each section the workbook provides an introduction, then takes you through the exercises as if you had an experienced marketing consultant standing by your shoulder. The exercises include worksheets and templates that you discuss and fill in, gathering information (some of which you wouldn’t have thought of!) and then gradually analysing the information to produce focused decisions and actions. So far I have found it to be excellent! It is very straight forward, easy to understand and the worksheets really help by providing the questions that need to be answered. Basically, by completing the chapters and worksheets, a very effective marketing plan has been created. Your Smart Marketing template makes it so much simpler and straight forward for any business to really hone in, identify and then focus (or refocus) on what they are doing so as not to waste time and efforts on needless advertising or choosing the wrong medium. This is a really good step-by-step guide to Marketing for SMEs, even perhaps for the self-employed individual who wants to do things better. It begins with a clear, helpful introduction and wraps it all up nicely at the end, with all the “meat” in the middle consisting of good workshop-style exercises that bring out all the important information, encourage brainstorming, and provide a good, simple format for drawing conclusions. I particularly liked the positively-framed “Bonus” at the end that provides ideas going forward. The workbook is written in clear, jargon-free language, always a good thing! There are also good reminders to us to use similar language in all of our marketing and selling – I liked the suggestion to look at the business “from the outside – in”, because, yes, we may know our product/service “inside – out”, but what does the customer/client see? So important, so easily forgotten! That is one snippet that has already sunk in. For my business, one perpetual headache is that of Pricing. Again, in Step 4, and Exercise 7, there’s lots of helpful advice and real-world thinking, all of which is going to be very useful to my partners and associates. All in all, a very helpful Workbook that is challenging without being “just hard work”! Buy the Workbook from Amazon now! 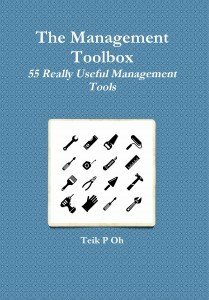 Teik has written a new collection of management and business tools called “The Management Toolbox – 55 Really Useful Management Tools”. As the title suggests, this is a curated compilation of management tools, but it’s in the way they have been organised and described that makes this book really useful to the entrepreneur who doesn’t have the time to do an MBA! It’s a book designed to be dipped into. If you have a problem you want to solve or you want to find the root cause for an issue, you find the tool that best suits. The tools are collected into groups that can be used in any situation, where you want to analyse business issues and problems, when you need to develop and choose the best solutions, and tools you need to implement solutions and monitor outcomes. At the end of the book the tools are also listed alphabetically, and by the task you are wanting to do. Each management tool is described by first defining what it can be used to do, then what it is and how it is applied, and finally you are given tips on how best to use it.